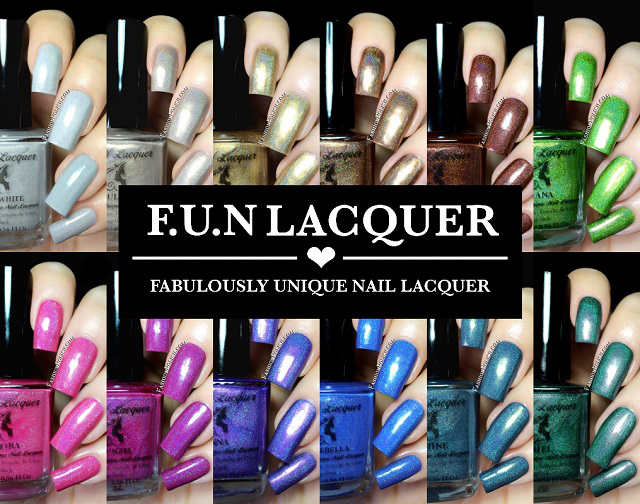 Fashion Polish: FUN Lacquer Princess Collection 2.0 : new and improved re-edition! FUN Lacquer Princess Collection 2.0 : new and improved re-edition! Hi guys! How's everyone doing?I'm super excited today because I have swatches of the FUN Lacquer 2014 Princess collection to share with you. You might remember the first Princess collection, released last year (link), well they all have been completely reformulated. Eleven harder, better, faster, stronger brighter, stronger holos and even a new color! Mulan is a soft beige linear holo. I was afraid it would clash against my skin tone but it does look great. I used 3 thin coats as well. Belle is a warm metallic gold linear holo. This one also has a little touch of gold sparkles and catches the light beautifully. I used 2 coats but I could have added a third. 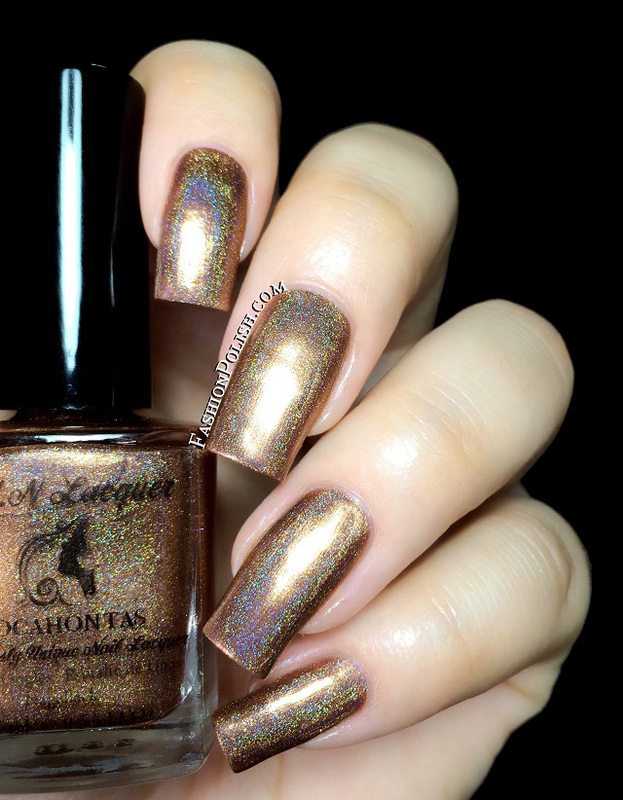 Pocahontas is a coppery chocolate linear holo with a metallic sheen. I expected to feel meh about this one but the glow totally converted me. Two coats used here. Merida is a warm, red based, brown linear holo packed with gold shimmers. Brown isn't my favorite color in the world but I have to admit that this one's pretty nice. Coats used :2. Aurora is a bright candy pink linear holo. Not bubblegum, girly or neon, just a beautiful pink. Again, 2 coats shown here. Rapunzel is a purple/orchid linear holo creme. One of my favorites, I don't think I have any other purple holo quite like this one. Coverage was excellent, I used 2 coats but bet you could get away with just one. Cinderella is a nice sky blue linear holo. The holo also looks faint here but it's stronger in real life. More jelliesque, this one's a true 2 coater. 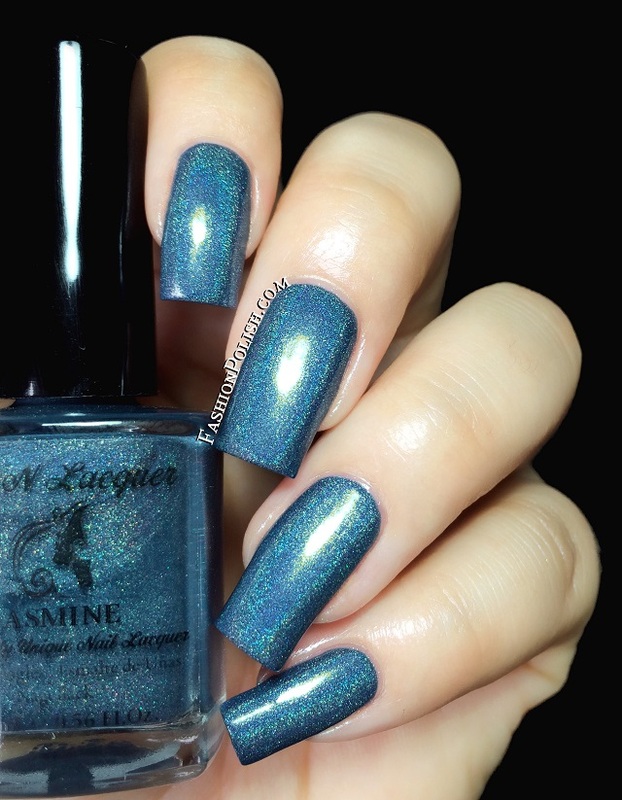 Jasmine is a medium-to-dark greyed-out blue linear holo. I knew I'd love this one the moment I saw it and somehow found it even more stunning on the nails! I also used 2 coats below. Tiana is a vivid grass green with a strong golden shimmer. It's one of those polishes you have to see for yourself to truly appreciate. Bright, saturated but not neon, so much glow. Again, 2 coats for complete coverage. Ariel is another love at first sight : dark, muted, hunter green base, strong pink flash and beautiful linear holo. Yes please! Another favorite, definitely. Two coats used here. And finally, Anna, this year's addition to the Princess collection, and my absolute fave : dark periwinkle, almost blurple combined with a strong pink shimmer and a beautiful linear holo. Just as easy to apply as the rest of the collection, good in 2 coats. Another beautiful FUN Lacquer collection and a perfect twist on last year's release. My top picks : Anna, Ariel, Jasmine, Tiana and Rapunzel. Don't forget to check my comparison post (link). Thanks for looking guys!